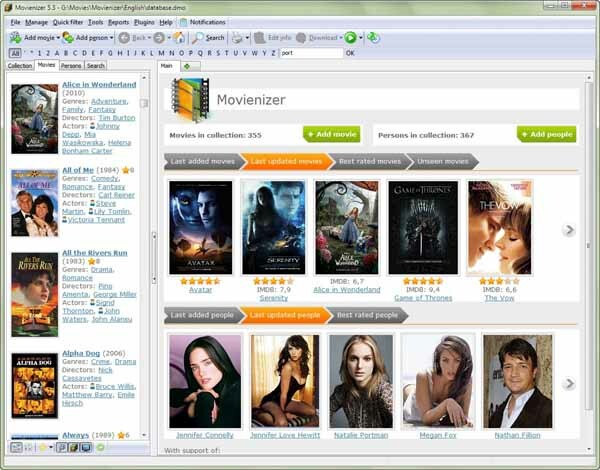 Free download Movienizer Latest Version. Do you like movies? If so, there may be quite a number of video cassettes, DVDs, HD-DVDs, Blu-Ray Discs etc. on your shelves, racks, behind your TV-set, under your bed… From time to time you find a movie that you never expected to have, sometimes you can’t find a DVD that you are sure you’ve purchased. With Movienizer you can easily find and collect information about your favorite movies. Do you like some actor/actress? Want to find out where he or she is also starring? No problem. Just launch Movienizer, select the actor/actress and click “Download” button. You will get the complete list of movies with the given actor/actress, plus important information and photos. Want to learn more about some particular movie in the list? Well, click it and hit “Download” once again. Movienizer will help you keep track on everything concerning movies. With its “loan manager” you never forget where your most valuable DVDs wander. Your personal rating will advise you if some Saturday evening you decide to watch ‘a good old movie’ with your family or your friends. You can mark the exact location of your media, define movies that you want to see next, inform yourself about future projects of your favorite directors.